Akshay Kumar is a 51-year-old man but he can still give the young actors a run for their money. Khiladi Kumar is a fitness enthusiast and he makes sure to keep his kids motivated too. 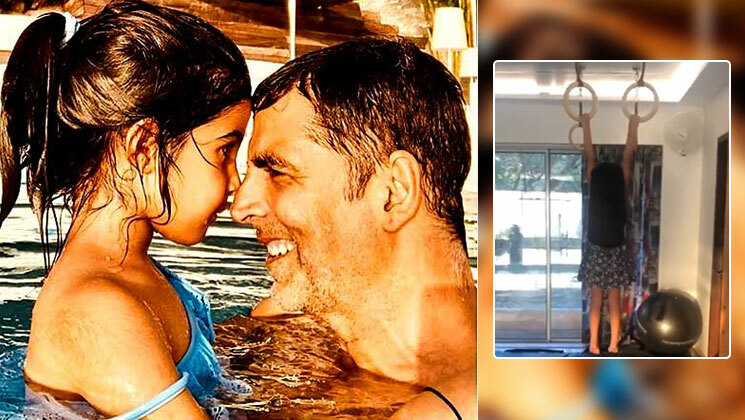 The ‘Kesari’ actor recently shared a video of his cute little daughter doing a hanging exercise. In the video, we can hear Akki motivating his daughter to hang on for some more time. And you will be amazed to see that she doesn’t disappoint. Akki shared the video clip alongside the caption, “It’s always a good idea to start young, their bodies are agile and flexible…a little push now will go a long way later.” And really, it’s commendable how Nitara is following the footsteps of his fitness enthusiast father. Now, isn’t this all the motivation that you need to Kick off your week? Akshay always keeps motivating his fans and followers by sharing such videos and we are glad that he does so. Because sometimes, a little motivation can really go a long way. On the work front, Khiladi Kumar was last seen in ‘Kesari’ and now he is gearing up for his upcoming films ‘Housefull 4′, ‘Good News’, ‘Mission Mangal’ and ‘Sooryavanshi’.